Mobile communication is one of the most-transformative technologies ever unleashed, and even reaches parts of the world where reliable electricity and running water are luxuries. There are some 7.2bn mobile connections in the world, compared to 1.6bn TVs and 4.2bn television viewers. It’s not just the ubiquity of mobile technology that is impressive, but the speed at which it has achieved mass penetration in rich countries and high-growth markets alike. It has taken mobile phones just three decades to outnumber the quantity of people on planet Earth. By comparison, radio took 38 years to reach 50m people, and TV took 13 years to reach 50m viewers. In many respects, Africa has led the world towards a mobile-first or mobile-only future, with countries such as Kenya leading the adoption of mobile money. Statistics from the Ericsson Mobility Report show that total mobile subscription penetration in sub-Saharan Africa is currently at some 80%, but will grow to 100% and 1bn mobile subscriptions by 2021. Mobile technology profoundly impacts Africa’s economy. It created a multibillion dollar industry that is a major source of tax revenue across the continent; that directly employs thousands of people; that creates livelihoods in airtime and phone retail; and that supports industries as diverse as IT services, advertising and media. Mobile has sparked change in sectors as diverse as health, agriculture and financial services, for example, by allowing unbanked people to safely transact using their smartphones or allowing traders to access real-time information. It has helped people and businesses of all sizes to become more efficient in how they do things. The internet is changing the way Africa’s people communicate at a fundamental level. The change is currently reflected by social media, but really it’s far more deeply rooted than a trend involving this or that platform, or brand. We live in a mobile world and it’s so clear in Africa — through the numbers, the stories and the people and partners we speak with. People are mobile, and businesses need to catch up. Consider that more than 120m Africans are on Facebook (this figure grew by 20% over the last six months alone), and more than 80% of them will return to Facebook using mobile devices. With the rise of smartphones and faster mobile internet connectivity, Africa and its businesses are on the cusp of the next wave of growth. The trend is particularly significant for the continent’s small businesses, which account for significant portions of GDP and employment in territories such as Kenya, Nigeria, and South Africa. Small businesses are the backbone of Africa’s economy. They drive economic growth and new jobs. The no. 1 reason small businesses succeed or fail is their ability to attract customers. But, with limited time and limited resources, this is expensive and hard for small businesses to do. This is why the rise of the mobile internet matters for small and emerging businesses in Africa. It creates new channels that they can use to connect with customers — whether local or on the other side of the world — in a highly personalised manner. It democratises marketing, allowing small businesses to do people-centred marketing at scale. The implications for African businesses are significant. Many small businesses around Africa use social media tools now readily available because they’re free, easy to use, and they work well on mobile. And it’s where their customers already are. What’s more, mobile marketing drives sales. While other forms of advertising — print, TV, radio — may be expensive and hard to measure, ads in mobile social media platforms reach the exact customers small businesses want to reach — for less money and great returns. And small businesses can affordably use sophisticated tools such as video to tell their brand stories. SMEs and one-man operations are able to design and deliver campaigns that factor in the audience’s device type and quality of network access quickly, and cost effectively. They can also take advantage of measurement and analysis tools that used to be the sole domain of companies with enormous bank balances. The potential for growth in sub-Saharan Africa remains healthy, with the mobile internet rapidly driving growth in internet penetration. Increased deployment of 3G and 4G networks will bring more African people onto the internet, and drive growth in the use of services from social networking to mobile banking and mobile commerce. Technology is already driving real progress. It is giving people a voice; handing a megaphone to the disenfranchised; and giving everyone the chance to counter messages of violence and fear. It is creating opportunity, helping people find jobs and start businesses. It creates new economic efficiencies and new opportunities for socio-economic empowerment and inclusion. In times of crisis, technology is helping people find each other, and helping people help each other. Africa’s mobile journey is just beginning, with great impact ahead for the continent’s people and organisations. Nunu Ntshingila is Facebook’s Head of Africa, with responsibility for leading the team that engages with agencies and brands in Africa to help them make the most of the company’s products including Facebook itself, Instagram and related services. She is passionate about the role of technology in driving social inclusion in Africa and about Facebook’s mission of creating value for African advertisers and people. 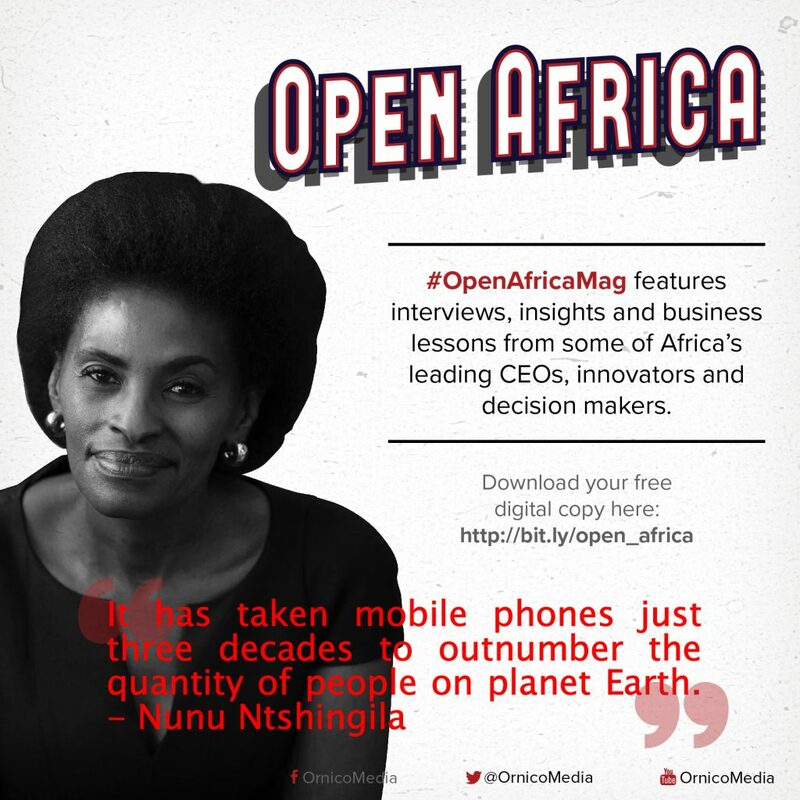 For more insights on growing businesses and brands in Africa, download your free digital copy of Open Africa here or go to http://bit.ly/open_africa.